I had a really interesting spam email judgement in my favour last week, against Liverpool based The Football Pools (TFP). My claim was essentially twofold – that they didn’t have consent to send marketing under Reg 22 of PECR and that therefore there was no lawful basis under the DPA1998 for the processing of my personal data. I sought damages under Reg. 30 of PECR and Section 13 of the DPA. The claim was for £3,000; my contention was that the marketing had prompted me to gamble and lose money, whilst I also sought compensation for the distress of having my data used in this manner to send unlawful marketing. By way of background, TFP used a company called Monetise (https://www.monetise.co.uk/) to send marketing on their behalf, who then sub contracted with an affiliate network. I received 3 emails from an unidentified sender in May 2018 (pre GDPR). On the matter of whether TFP instigated the email, they claimed they weren’t the instigator, as that role fell to Monetise who instructed the actual sender. I argued we should go to the head of snake, the company whose products and services were being marketed. I quoted the Vanquis Bank ICO penalty and the judge agreed that they had instigated the marketing. They also argued that I had consented to receive the messages by virtue of visiting a (now defunct) competition website and provided me with an IP address from which my email was allegedly provided. I explained to the judge that I wasn’t in anyway associated with the IP address and that further, even if it was held that it was me, the consent obtained was just a typical generic third party statement that had no mention of TFP. The judge accepted my initial arguments that Id not entered my details via the stated IP address, so we didn’t really get into the generic point. She seemed to place considerable weight on the fact that I’d raised this several months ago with the TFP and they hadn’t provided any further evidence. Part of their defence was that by virtue of having a contract with Monetise, which required the latter to comply with all privacy laws, they had taken reasonable care which is a defence under Reg 30 (2). I was able to highlight Paras 57-58 of the ICO’s enforcement notice against Vanquis as what reasonable care might consist of in terms of due diligence. It felt rather hollow to me to argue that they weren’t the instigator, felt there was valid consent but even if those 2 things weren’t the case had taken all reasonable care. Surely that falls on its own terms given they didn’t even release they were responsible? They had no evidence of any due diligence or other controls and the Judge therefore found they had not taken all reasonable care. They hadn’t even produced the contract as evidence, relying on a witness on a Witness Statement quoting its existence. Counsel claimed that any losses for gambling weren’t recoverable as they were a “novus actus interveniens”, ie something I had chosen to do and not directly flowing from the marketing itself. I shared some stats from the gambling commission about how effective email marketing was and argued that the very intent of the advert was to get people to gamble and therefore quite from being unforeseeable it was the intended outcome of the message. I’m not sure what the judge made of that point because she found that I’d failed to substantiate my losses to the required standard and therefore dismissed this part of my claim. The judge stated she’d look at my claim under both pieces of legislation and, having found there was a breach of Regulation 22 of PECR, awarded me £750 damages. She seemed persuaded by my arguments that nobody had ever explained to me who else was in the web of data traders and therefore my distress about being targeted was enduring. She was a little vague about whether the award was under Reg 30 or Section 13 and in this regard I felt it was quite a generous judgement as it’s only really the DPA that should pay for distress. The judge also made them pay my fixed costs of bringing the claim, the initial issue fee (£105) and hearing fees (£335). Despite having the judgement partly in my favour, Counsel still tried to argue for costs on the basis of CPR 27 .14 (g), partly on the basis Id been to quick in bringing the case. I didn’t need to make any submissions on this point as the judge quickly dismissed this point. Overall it was a bit of a rollercoaster of an experience, but one that I hope plays a role in encouraging marketers, especially in toxic industries, to be a bit more considered in their activities. Roses are Red, Violets are Blue, If you send me spam emails, I will sue you. A bleak and dreary Shrove Tuesday in Manchester saw my debut appearance in the Small Claims Court, an experience I found fascinating and infuriating in equal measure. My claim was therefore on the basis that Koi had been unlawfully processing my data and sent marketing in contravention of Regulation 22 of PECR. Their marketing had included, amongst others, spam on behalf of a gambling firm, along with companies called Property Rescue, 1ClickHomeLoans and some low grade credit providers. In the hearing itself, it soon became apparent that there were some procedural errors with some of my evidential submissions, which immediately put me on the back foot, although we soon got down to business about whether they had valid consent. My argument was essentially twofold, a) I hadn’t completed the form and b) even if I had, it didn’t constitute valid consent, as required by Regulation 22 of PECR. The Judge firstly found on the balance of probabilities that I had completed the survey. She essentially said it was for me to prove that I didn’t and asked what evidence I was relying upon to support my position. I pointed out it was difficult, if not impossible, to prove such a negative, which she offered some sympathy towards but ultimately stressed it fell on me as the complainant to prove my case. She then turned to whether the consent was valid. One of the documents I’d submitted was the ICO’s Direct Marketing guidance, which of course makes it very clear that indirect consent is almost impossible to achieve for electronic marketing. It also explains quite clearly that things like pre ticked boxes are a no no, consent doesn’t last forever and can’t be onward shared, all of which I thought were against Koi here. I also highlighted the definition of consent in this context was related to the European Directive 95/46/EC. The Judge said she wasn’t bound by that but would use the definition nevertheless. However, she also referenced that consent had a natural meaning through contractual law and I felt like I struggled to distance her from the more everyday meaning of the word. After some debate around these points she essentially concluded the wording was sufficient for an organisation like Koi to send me a range of marketing so long as it was for the sectors listed. I pointed out that the statement made no reference to Koi and that Interactive’s partners essentially could amount to any organisation, at anytime. She basically nodded that yes that was what I’d agreed to and therefore found the consent was valid. The claim was therefore dismissed. It seemed to me that the Judge didn’t appear to be particularly knowledgeable about the rules around Direct Marketing and I definitely erred by not making enough explicit references to the legislation within my case. At one point there was a suggestion that I might have been seeking dual remedy as I’d already asked the ICO for an assessment as to whether there had been a breach. Obviously I was quick to highlight that the ICO specifically direct individuals seeking redress to the Court, but I was somewhat surprised to be having to explain that at all. Whilst I wasn’t at all confident of being awarded damages, I hadn’t expected to lose the decision on the basis of consent, especially where such a conclusion appears to contradict both the ICO’s extensive guidance, and more worryingly, the legislation itself. “As an aside, we have recently held several meetings with our lawyers to discuss the implications and action points of the incoming GDPR legislation, around which there has of course been much discussion lately. We are fundamentally committed to remaining 100% compliant to both current and future legislation”. 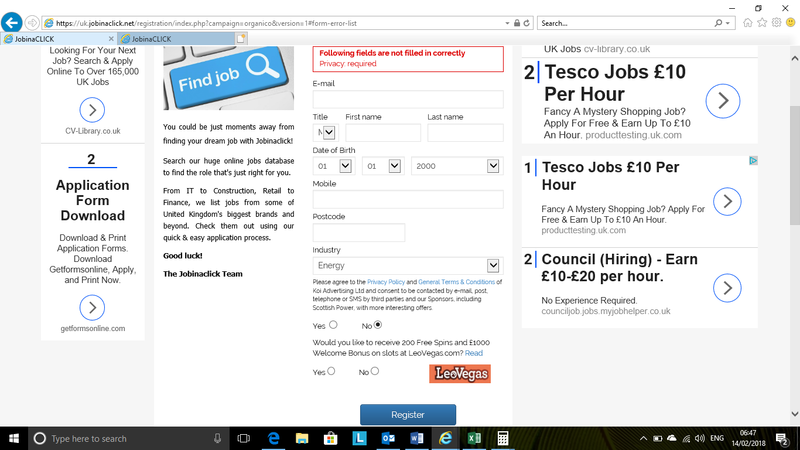 Koi also run https://uk.jobinaclick.net/, on the surface a jobs board but one that appears little more than a data harvesting model, as the terms confirm that once you’ve given them your data “you acknowledge that we will not process any job application or submit any information on your behalf to any recruiter in respect of any job”. If you want a holiday or a job, it might be wise to look elsewhere. I’ve written previously about the use of affiliate marketers in the Gambling sector, which I’ve come to realise is a significant issue across the industry. It seems nobody has a bigger problem than industry giant Ladbrokes, despite a commitment to “being a leader of our sector in responsible business practice”. “The marketing email to which you refer was sent to you by one of Ladbrokes’ marketing partners, a company called Emailmovers (www.emailmovers.com). Emailmovers acquires personal data from user activity on its own websites and from third party sources. It is therefore Emailmovers, and not Ladbrokes, that controls the list of email addresses to which the relevant email was sent. Emailmovers advises that you gave your consent to receiving marketing emails at 14:41 on 28 July 2009 via www.loanandgo.co.uk; and that it is for this reason your email address was captured and ‘opted in’ to receiving marketing communications from Emailmovers. We understand, further, that your email address is included on two separate databases that are made available to Emailmovers”. To put that another way, Ladbrokes (and their marketing partners) believe that because I apparently applied for a loan in 2009, I’m an appropriate, willing and therefore lawful target to receive marketing some 6 years later. That particular piece of marketing and comment came after several requests to Ladbrokes explaining quite clearly that I didn’t wish to receive to marketing enticing me to gamble. As I previously highlighted, the ICO regard an organisation using affiliates as “instigating” the marketing, a natural and reasonable interpretation, which of course means in these circumstances Ladbrokes had responsibility – and liability – under the Privacy and Electronic Regulation Communications (PECR). I therefore asserted my rights in accordance with Regulation 30 of PECR and claimed damages from Ladbrokes for these repeated contraventions of PECR. Even after one settlement in relation to the first batch of spam, subject to a confidentially agreement that was broken by Affiliate marketer Matt Jacobs, when he wrote to their partners to call me a “troublemaker”, the messages continued. I therefore submitted a further Small Claim’s Court claim. Somewhat amusingly, they couldn’t even muster the energy to hoist the white flag on the more recent claim, completely failing to respond to the Court leading to a judgement in default. Their reluctance to open to their post continued, meaning my requests for payment were also ignored. I therefore instructed Bailiffs to collect the debt, who after 3 visits to HQ, finally managed to secure my full claim and costs, displayed below for reasons best described as tacky smugness. 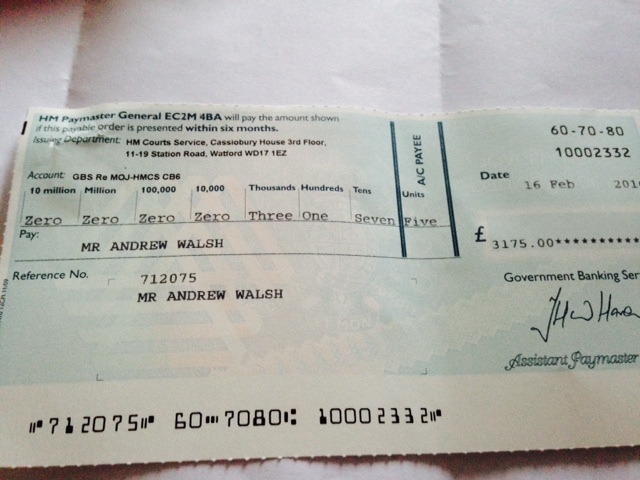 On a more serious note, such is their lack of control of their web of affiliate marketers, that even after such a settlement, further marketing messages have continued to come in – an astonishing 20 emails in the 10 days after my cheque arrived. I’ve repeatedly sought the advice of the Head of Responsible Gambling at Ladbrokes, Graham Weir, as to how I might stop these latest invasions of privacy. His initial response was for me to opt out of the latest emails, advice which I pointed out was contrary to the ICO’s own advice not to respond to unknown links (so as not to confirm a live email address). He then told me to follow the ICO’s advice, before the Legal Department wrote to tell me to follow the unsubscribe links on the two examples I’d forwarded them, whilst not taking an interest in the other 18 examples I had offered to send them. 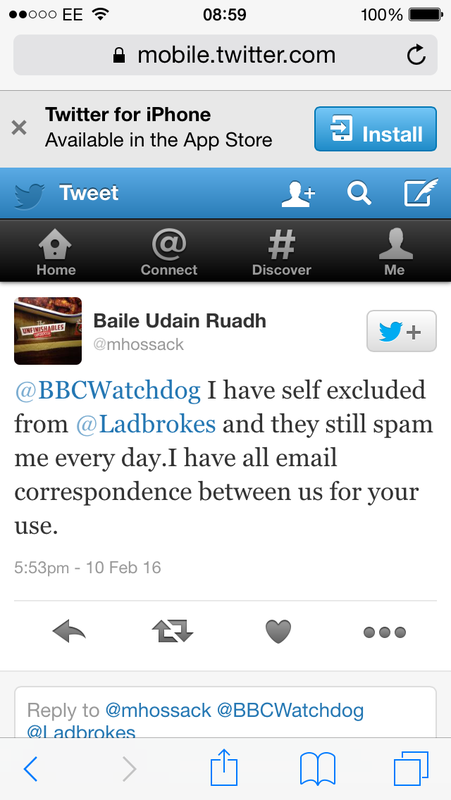 All the emails were displayed as being from Ladbrokes. “We did not send, and were not responsible for, either of these two messages…We strongly refuse any suggestion that our marketing activities contravene relevant legislation”. Perhaps someone is taking upon themselves to unlawfully market Ladbrokes without any inducement? Or perhaps Ladbrokes are taking the piss. A quick Twitter search for Ladbrokes Spam brings shows a similar attitude of distancing themselves from the affiliates who are doing their unlawful dirty work, along with examples of them spamming self excluded customers and children. Even aside from the blatant breach of PECR, quite how that fits with Ladbrokes stated commitment to Responsible Gambling, I couldn’t tell you. The man who could tell us that, the aforementioned Graham Weir, has repeatedly failed to give me any assurance that he can control the rabid affiliate marketers. In my case, unable to offer any advice as how they may stop their aggressive affiliate campaign, they instead served me a Trespass order from entering their shops. As well as being rather ironic, this entirely missed the point. 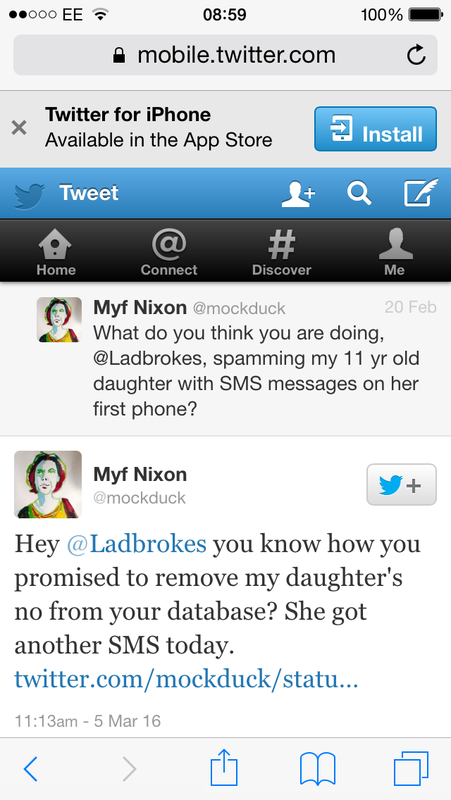 “We do however encounter some difficulties when we acquire customer lists through normal legitimate sources e.g an existing customer may have opted into to receiving third party communications on a list that we, or one of our agencies acquire using a different email from the one associated with their Ladbrokes account. In such circumstances they might then receive a marketing communication from us. We believe that the way in which customers opt “in to” and “out of” sharing their information in the current context of data protection frameworks and the obvious lack of a centrally managed (by our regulator) database that people might opt into is very likely to result in frequent failures”. His comments appear to show a remarkable level of comfort in knowing his organisation will continually fail to adhere to individuals wishes by using third party marketing consents in a manner contrary to the ICO’s Direct Marketing guidance. It’s simply a stone cold commercial decision to ignore people’s direct, express wishes, presumably on the basis they may have previously failed to (un)tick a box when applying for a loan 6 years ago. “The top most reported category was gambling, with 155 concerns. This topic is often in the top three most reported sectors and we are continuing to work closely with the Gambling Commission on this issue”. This referenced “close work” the Gambling Commission has been going on since at least last summer, although clearly with limited success given the number of complaints is broadly the same as the January before and likewise higher than 2 of the previous 3 months. Despite the Sector being top of the Spam text chart, and regularly being in the top 3, there hasn’t been a single piece of Enforcement action against any gambling firm. Perhaps even more surprisingly given the ongoing abuse, nor is there a gambling firm on the list of companies under monitoring. I’ve made an FOI request to better understand the lack of action, but notwithstanding that response, I’d strongly suggest some stronger action might be required here. Meanwhile, the Gambling Commission, despite confirming that they hold Licence holders responsbile for the actions of their affiliates, have shown no interest, perhaps because they don’t act as a complaints handler and thus have a documented compliance approach that makes no mention of acting on any information they receive regarding non compliance. They look and act like an organisation funded for failure, with ambitions to match. 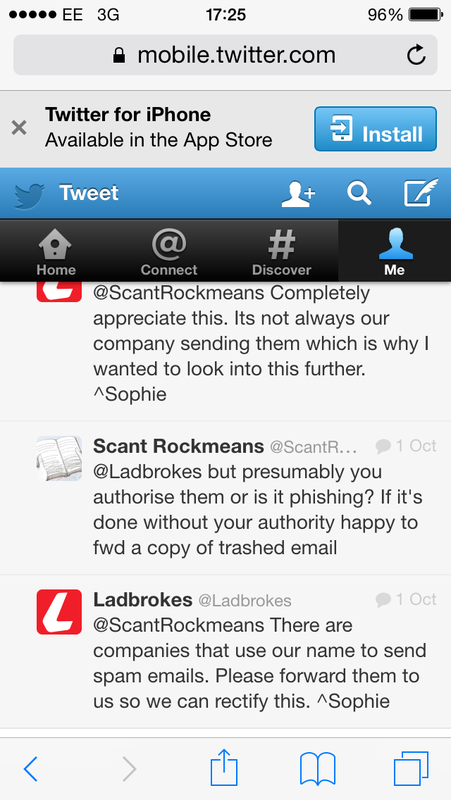 As a final thought, it’s not just PECR Ladbrokes seem happy to disregard. I made 2 Subject Access Requests last year, both of which were completely ignored, meaning I had to wait 40 days to then get the ICO to chase them to provide a response. A more recent SAR was met with asking me to justify why I wanted the data (I explained), followed by a further 30day wait and then a request for a fee (admittedly compliant, if unsatisfactory). As a privacy professional it’s pretty disheartening, but not uncommon, to see an organisation completely ignore their obligations when it’s easier to, especially when they gain commercial advantage for doing so. Most organisations will make mistakes, mis SAR deadlines and generally seek to stretch the boundaries in matters of marketing – but when an organisation willfully disregards its obligations, it would be nice to see some strong regulatory action. In the meantime, I’d encourage those blighted by spam to take individual action, a route I intend to revisit in respect of the recent score of unwanted emails. Late last year I received several text messages inviting me to open accounts with several different gambling companies. I had not consented to receive such messages and none of the messages contained opt outs, meaning the messages were sent contrary to the requirements of the Privacy and Electronic Communication Regulations (PECR). As someone who has learned the hard and expensive way that it’s not a good idea to try and put one’s money where one’s mouth is, the receipt of these unsolicited text messages encouraging gambling were very much unwanted. One such text was marketing Betfair, and as you can see from the screenshot, the text was displayed as being from the name of the company it was promoting. “The text message was not sent by Betfair – it was sent by a third party. We did not instruct the third party to contact you, and your mobile number was not known to us. It is likely that the third party obtained your consent for marketing (and mobile number) from another website. We will inform the third party to stop sending marketing communications to you”. At this point, one may note that from that text message, Betfair (and only Betfair) were able to identify the sender of the message and able to instruct him to stop sending messages. I would assume the hyperlink within the message was a unique code allocated to the given affiliate for the purposes of tracing commission. The message also appears to contain a “Freebet” offer, which presumably was also sanctioned by Betfair. When I chased further details of the alleged consent that it was “likely” I had provided, Betfair informed me the third party was insistent he had consent to contact me, although they would not expand upon this. They subsequently did provide the details of the third party, who transpired to be a gentleman in Israel. Betfair also provided me his address and Gmail email address, inviting me to take the matter up directly with him and essentially saying it was nothing more to do with them. Having google’d the third party’s details, there appeared to be an individual with the same distinctive name who was employed as “Head of Affiliate” for one of Betfair’s major rivals. I had previously held an account with the rival company, so it crossed my mind that the individual may have obtained my details from the Competitor database for his own ends. That would of course constitute a criminal offence under Section 55 of the DPA. I thus flagged to Betfair that there was the potential that the third party could have obtained a customer list from his employers but they did not acknowledge my comments. After discovering the same third party was responsible for the other marketing messages I had received, I eventually reached an agreement not to pursue a claim against him personally for any impropriety or unlawful processing of my data. The third party who sent the message was an accredited Affiliate partner of Betfair’s, who was being financially incentivised to encourage people to open accounts with Betfair. The Betfair Affiliate terms required the individual to comply with PECR, which implies that Betfair were happy for their affiliate marketers to market their product electronically. 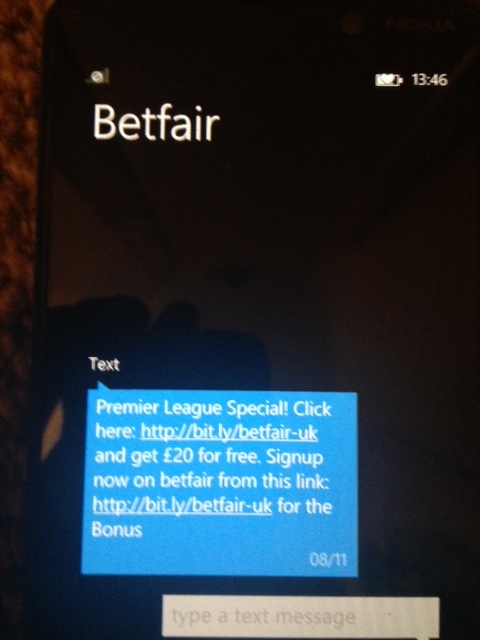 If a third party wants to send a text message about a Betfair promotion, the third party must make it clear that the text message is being sent by a third party (not Betfair). The third party is also responsible for ensuring that they have relevant consent and comply with all applicable laws on direct marketing. On this occasion, the person who marketed to you gave the impression that they were Betfair, and they didn’t make clear that the message was sent by a third party. As mentioned above, this is a breach of our Affiliate Affiliate Programme Terms and Conditions where it states at Clause 3.1(n):- “you will ensure that all communications originating from you relating to Betfair make it clear that such communications are sent by and on behalf of you (and not from or on behalf of Betfair)”. Following your email, we have reminded the third party about the rules set out in the Affiliate Programme Terms and Conditions. I do recognise that the third party has acted outside of the requirements of their affiliate Terms, but I believe that a breach of the Affiliate Terms is between Betfair and their third party. It almost feels like Betfair are saying that precisely because of their lack of controls and due diligence, they are not liable. However, you cannot simply outsource your liability to comply with PECR. You must not allow your line to be used in unlawful marketing. In anycase, it is apparent that Betfair have been benefitting from the arrangement in the form of customer referrals and the third party has been financially rewarded for this. The individuals such as myself who have suffered the breach of privacy and unlawful marketing do not seem to interest Betfair. Indeed, despite the breach of the Affiliate Terms it seems Betfair simply reminded him of his responsibilities. If a gaming company allow an affiliate to send messages without consent, and without an opt out, this very much the kind of breach of a kind likely to cause both damage and distress. Given the intention of the message is clearly to encourage individual to gamble, it does not take any intellectual gymnastics to construct a set of circumstances whereby financial damage would occur. The distress of receiving repeated texts, even from organisations whom you may have self-excluded yourself from is also hopefully equally clear. “you would be instigating if you encourage [emphasis added], incite, or ask someone else to send your marketing message”. I interpret Betfair’s position to be that they don’t encourage affiliate marketers on the basis that they don’t directly instruct them to market Betfair. Rather, Affiliate marketers may take it up themselves to market Betfair (at which point Betfair will be of course reward the Affiliate) . I find that an exceptionally weak position and contend that they have encouraged the sending of the message by incentivising their affiliates to send messages. If there was no Affiliate scheme instructing people what they should do if they “wish” to send text message promoting Betfair, there would be no text message. If I’m wrong and Betfair successfully argue they didn’t instigate the message, then the marketing industry will have discovered a very easy route around complying with PECR – just use affiliate marketers (ideally individuals outside of the EEA) to do your dirty work. A further defence offered by Betfair was they had my consent to market me because I agreed to receive marketing when I opened my account with Betfair. I have no reason to doubt that was my marketing preference, but as Betfair themselves explained, I opened my account in 2003, so to rely on that consent would also be a particularly expansive interpretation of PECR’s description of consent “for the time being”. In anycase, as Betfair confirmed previously, my current telephone number was not known to them, so they do not have consent to market the telephone number I received the marketing on. At no point did Betfair directly address the additional breach of a lack of opt out within the message, but they did also present a further contradictory argument that if I wanted to opt out of marketing, all I needed to do was log into my Betfair account (from 2003) and amend my marketing preferences. So Betfair, a company who are supposed to promote responsible gambling, think it is a reasonable (and lawful) policy to require former customers, presumably including problem gamblers, to log into their accounts. Quite aside from wildly misunderstanding their requirements under PECR, that is a revealing insight into their attitude to responsible gambling and general customer service. “any proceedings will be handled by external lawyers and we will seek to recover those legal costs, in full, from you”. As a matter of principle, that’s one gamble I’m willing to take. The ICO’s recent(ish) Data Controller (DC) and Data Processor (DP) guidance has received alot of unfavourable attention and I’m afraid the Policy Department will have to also me to their vodoo doll collection, as I find it a really strange piece of guidance. What’s been presented as a clarification of an area organisations struggle with, infact appears be a significant change to the working understanding of some notable experts within the field. “activities such as interpretation, the exercise of professional judgement or significant decision making in relation to personal data must be carried out by a data controller”. A bank contracts a market research company to carry out some research. The bank’s brief specifies its budget and that it requires a satisfaction survey of its main retail services based on the views of a sample of its customers across the UK. The bank leaves it to the research company to determine sample sizes, interview methods and presentation of results. The research company is processing personal data on the bank’s behalf, but it is also determining the information that is collected (what to ask the bank’s customers) and the manner in which the processing (the survey) will be carried out. It has the freedom to decide such matters as which customers to select for interview, what form the interview should take, what information to collect from customers and how to present the results. This means that the market research company is a data controller in its own right in respect of the processing of personal data done to carry out the survey, even though the bank retains overall control of the data in terms of commissioning the research and determining the purpose the data will be used for. “determines the purposes for which and the manner in which…”. I’ve added the emphasis because I think this is basically where the ICO have lost their way. “retains overall control of the data in terms of…determining the purpose the data will be used for”. They recognise the market research company is not determining the purpose for which personal data is processed. They are, as the guidance notes, making some decisions on the specifics of which data is collected in the sense that they are being allowed to use their technical experience (or is professional judgement?) in setting the questions and selecting the sample size etc. As I understand the guidance, it’s precisely the action of granting this freedom to the market research company to have some control over the manner of the processing that makes the market research company a data controller. The less prescribed the instructions, the more control is exercised by the market research company. However, if one follows that through to it’s logical conclusion, then how would you assess a relationship where there is no written instructions/contract at all? If you don’t tell a contractor exactly what to do and he solely makes decisions on, for example, the deletion of the data, is he not more likely to be considered a data controller? It’s not like loss or misuse of the data would be a breach of contract (only of the DPA). A final word on that market research company. If they lost the customer dataset providing to them by the bank, does anyone actually think the ICO would turn to the market research company as opposed to the bank who commissioned them on the basis it was the former who had been deciding the same size and were therefore the Data Controller? Even I’d fancy my chances of arguing on behalf of the market research company that the charge falls at the first hurdle because they are not determining the purpose for which the data is processed in accordance with the definitions of the DPA. The motivation for this blog was my own difficultly in understanding where contractors/partners are DC/DP’s. For example, if I worked for a moneysupermarket type platform and was advising on a contract with a number of insurers who were on a panel to quote for insurance, my biggest concerns when passing them data would be to ensure the data would be kept secure and not processed for additional purposes. I’d look to complete some due diligence around their processes. Id also ensure contractually they were limited to processing data for a specific and limited purpose – i.e. the provision of a quote. To my mind, they have, and always have been, Data Processors because only my organisation decides the purposes for which the data is processed. It’s solely and specifically for providing a quote. Of course they will primarily decide the manner in which it’s done because it’s their own professional judgement technical expertise that will make a decision about the risk and determine the quote. However, in crude terms, they do as I tell them with the information I give to them. I’m only discussing the provision of the quote – obviously if/when a customer wants to take that up, that’s between them and the provider, at which point they will of course become a controller. I collect the data, I’m responsible for a fair processing notice and liable for any loss of the data. Well, that’s what I think and although it also seems to be what the Enforcement department think, the policy guys appear to be swimming against the tide. That’s not to say they are wrong, but if they are making significant changes to the ICO’s position, they should perhaps flag that more clearly. To be honest, when debating some of the above points with partner organisations who were adamant they were Data Controllers in a similar scenario to the above, I quickly reached the point of complete indifference. If I’ve got a contract getting them agree they will process data for the single specified reason I’m giving it to them and I’m happy with their security (et al) processes then what’s left to squabble about? If they lose the data then at worst the ICO regard me as the DC – if the partner company insist they’re a DC then they are simply putting their hand up to the liability. The reputational damage will nearly always sit with the source organisation, but that’s the case irrespective of who is the DC/DP in the ICO’s eyes. So, whichever way the ICO guidance wind might be blowing, it’s business as usual for me. The cost of FOI, something which has previously caught my eye, has once again reared it’s head on account of SCC’s decision to publish what they hold to be the cost of requests. Let me try firstly to calm the sensitivities of the transparency lobby by repeating that I believe in FOI as a legitimate cost of democracy. But let ourselves be open, honest and transparent about that cost – it’s not an Act that needs rely on the crutch of capitalism, rather it is a legitimate price of a modern society. Equally, what a Council spends on FOI must be considered against what it spends on other services it provides. I don’t doubt for a minute SCC’s release is an attempt to dissuade people from making requests, and nor do I doubt it will only provoke those outraged by a public authority trying to save money/reduce scrutiny (we’ll show you to question us). However, I do absolutely dispute that their cost of handling FOI is 0.00003% of the council’s budget, based on the fact the cost of FOI is £31,700 of the £975 Million budget. The council has also been widely criticised on social media today for publishing how much it costs to respond to the requests. Why would a Council be widely criticised for publishing their costs? Who do we think has criticised this particular piece of transparency? Well, mainly those who argue most passionately about transparency. Publishing the estimated costs of requests from certain groups/campaigners is, at very least, not in the spirit of the Act, which is intended to be motive and applicant blind. Aside of any data protection issues, publishing the names of organisations that are frequently asking for information may deter others from making requests. It also creates the inference the organisations are wasting public money by asking for information. Firstly, I don’t think the motive and applicant blind principle needs to extend to not revealing how many local newspapers have made requests. There’s definitely a wider potential issue around the release of personal data, albeit with the caveat that nobody cared till the Council implied a problem with FOI, but that’s another blog altogether. “also creates the inference the organisations are wasting public money by asking for information”. There is irony, but there is also hypocrisy, and I’m afraid the above statements wade into the latter. Is it really the case that if the public know which organisations are costing the most money by making FOI’s that they (the public) will infer that these organisations are wasting money in doing so? And demonise them for doing so? Yes/no/maybe is my answer. But let the public decide for themselves, isn’t that the whole idea? Would/should the same information be released under FOI? I respectfully suggest Matthew et al would be arguing it should be. I do absolutely accept that a public authority shouldn’t be able to provide skewed data to provide a point (or save money), but do the critics really believe that the cost of FOI for SCC was £32k over 2 years. I don’t necessarily expect pressure group activists to make an argument for their opponents, but there is a further irony in transparency campaigners, accepting (and using) figure that a Council manage to spend circa £16k a year handling FOI without question. Add a decimal point and I suspect sure you will be closer to the truth. If you disagree, then please consider they handled 1320 requests in a single year. Did one person do them all, without training, staff time, printing, postage etc? If you want to handle 1320 requests for £16k as an outsourcer I’m sure you get the gig – especially if you agree to cover internal review and information tribunal costs. As a guide I did circa 200 requests a year whilst being paid £25,000. I recall the fuss about Nick Griffin being included on Question Time. I felt then, as I do now, that the facts should speak for themselves. If you can’t make Nick Griffin look like a clown then that’s on you. And if you can’t make FOI a worthy proposition then that’s also on you. I admire the impact and principle of one, and not the other, but strongly believe that one should be able to win, not suppress, the facts of a debate. Internal briefing notes are drafted by some teams within the Council to record progress when responding to the request, and provide context on the request, for the benefit of colleagues assisting with the retrieval of information. In such a circumstance, information may be gathered from the public domain, for example an internet search of the requester’s name and whatdotheyknow.com; ascertaining research interests of the requester can assist the Council in providing additional context to an FOI response, hopefully adding to its intrinsic value. This process has been termed ‘profiling’ and David has also provided a further piece for the Guardian here. Tim Turner also wrote an interesting piece examining the basis for the profiling under the DPA. David has taken an example of an FOI officer producing a brief, publically sourced summary of the interests of the requester (and by implication the context of their request) and suggested it highlights a wider problem of a lack of engagement within public authorities with FOI. His piece for the Guardian went further still , straying into inaccuracy when claiming applicant blind “is the principle that anyone who puts in a freedom of information (FOI) request can expect his or her identity not to be released or examined”. Without wishing to be overly pedantic, I think that’s a slightly inaccurate summary of the principle, which in my opinion is being taken a little too literally by a number of commentators. In anycase, those who don’t wish for their identity to be released would probably be advised not to use a public forum such as whatdotheyknow to make their request, as the delightful Rebecca (“don’t kind regards me”) Hamsley did here. The principle, in my view, is infact that identity and motives of a requestor should have no bearings on the information disclosed under FOI. Basically, you can’t refuse a request from a journalist because you think they want to write a negative story about you. I honestly don’t think that extends to saying that the format, language and tone of a response should be the same irrespective of whether it’s received from the local crank or the Prime Minister. The legislation is clear about what is expected in a FOI response, a refusal notice in particular is very prescriptive and surely it’s the end result that we should look at to see a request has been handled correctly. I thus think David misses the mark – widely – by claiming “if ever there’s an example of ignoring applicant blind, it’s this”. As David himself quotes from the ICO guidance “the information someone can get under the Act should not be affected by who they are”. In this case, Rebecca Hemsley received the exact same information that a journalist, student, foreign individual or local crank principled campaigner would have received – nothing. To come up with an applicable example of ignoring the applicant blind principle, surely one would be better sourcing an example of how a different level of information was provided because of the identity, or motives of the requestor. The example of a tfl response/handling of a request was also raised on Twitter, but from what I can see, the majority of the discussion was around what additional information to provide outside of the requirements of FOI. David also implies a breach of the principle by virtue of the fact that requests from the press might be shared with the press office, commenting “in recent years, it’s become commonplace to hear stories of councils briefing press offices about requests from journalists”. I can confirm that request handlers at the ICO were infact asked to let the External Communications team know of any request that might be high profile and/or those from the Press. That wasn’t so they could overrule a decision on what to release, but rather so they could be aware of the potential fallout and be well placed to handle potential queries, the majority of which would of course be from the Press. In short, they needed this information to their job. On at least one occasion I personally also shared the identity of a requestor outside of the ICO when I was consulting with another organisation, where the requestor themselves had placed their request in the public domain. An FOI handler needs to be independently minded, but that doesn’t mean they can’t consider the consequences of FOI and still safeguard the reputation of their organisation. Effective FOI is rarely about the strict provision of information, without adding some supplementary explanation. I’d much prefer to see an FOI request where time is taken to provide context at the time of the request. A recent example was the release of Council spending on an IPAD that ended up in the MEN. Stockport Council spent £26,000 on IPAD but later provided the context that it saved them £20,000 in printing costs, so straight away their apparently profligate spending was firmly rebutted and taxpayers could breathe a sigh of relief and aim their anger artillery in a different direction. A public authority who recognises the motives of someone making the request has the potential to add great value to the process. Recognising that the MEN were gathering information about profligate spending on IPAD’s by Councils, would have allowed Stockport Council to add a context to the request at the time it was made. I do take the point that arguably that context should be provided to all requestors, but if you know the request is from a student who is interested in the use of IPAD’s compared to other tablets, then I’d suggest the specific supplementary explanation quoted above is redundant. As with so many things, context is key. As I say, information is isolation is less likely to be productive. I’m fairly sure when handled this request for the ICO’s (in)action to the non notification of MP’s that I will have flagged to the relevant department the context of the requestor’s previous posts on the same topic, where he articulated his concerns. I didn’t really know a lot about the thought processes behind my colleagues processes, so by sharing Jonathan’s earlier comments they could at the very least provide me with a supplementary explanation that went to the heart of his concerns. On the back of this scrutiny they might even have decided to do a bit more in their work in this area. I regarded all of this as a healthy outcome, much more positive than ignoring the underlying basis of his concern. I can further share that I will have been allocated Jonathan’s request on the basis that I had previously dealt with a request on non-notification by the same requestor. Strictly this would also run contrary to David’s literal interpreration of applicant/purpose blind, given it was precisely the identitiy and motive that led him to drawing the short straw and having me handle the request. “the processing is necessary for the purposes of legitimate interest pursued by the data controller…except where the processing is unwarranted in any particularly case by reason of prejudice to the rights and freedoms or legitimate interests of the data subject”. I take a subtly different view to Tim, who in the case of Hackney Borough Council, felt that the Council must demonstrate a) that the profiling is necessary, b) its legitimate and c) that it doesn’t cause unwarranted harm. I feel that a) the profiling is a legitimate interest b) that the processing of data is necessary for the purposes of that legitimate interest – and we both agree on c). I might be wrong on this, but I feel the legitimate interest is in explaining the context of JB’s request was to help me provide a better response. The processing of his data was necessary to do that. It’s the act of processing, not the legitimate interest, that has to be necessary. Some have raised the cost involved of the profiling as an additional reason for concern. I think in both the example given by David and in my experience, we aren’t talking about significant work. Even if one dismisses the potential benefits of providing additional context, on the known facts, it still seems difficult to suggest that profiling is something that weighs heavily on the taxpayer. It seems an accurate but regretful reflection of the adversarial nature of FOI that, in the absence of any evidence and despite the explanation directly to the contrary, the Hackney case is automatically assumed to be an example of not embracing FOI. I’m not naive enough to swallow everything a public authority says, but on the basis of the evidence here I hold considerable sympathy with Hackney for ending up named in the Guardian as an authority who don’t embrace FOI.